Keep all of your vaping accessories in the convenient Vapor Zeus carrying case. Carrying case fits Vapor Zeus batteries, EGO batteries, Tube mods, e-Liquid bottles, Smileomizers and Vape tanks. The Vapor Zeus Carrying Case has a length of 7.5 inches and a width of 4 inches. 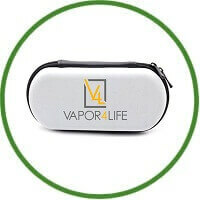 What’s in the box of Vapor4Life? What Are The Features? The e-cig itself is a very appealing two piece design. The exterior of the batteries is coated with a soft rubber, which makes it gentle to the touch which is really a nice feel. 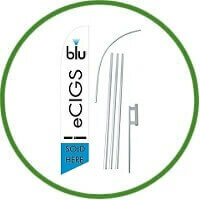 They also come in a wide-range of styles and colours, so you’ll have plenty of choice for how your e-cig looks. The tip is a plastic faux-diamond which may appeal to women more than men. The emphasis is on choice here and the flavours are quite appealing. The choices are limited with the starter kit, but there are more than enough options. You have plenty of tobacco options, mint options, sweet options and coffees and chocolates. The cartomizers gave full flavour up to around 175 puffs, so that was enjoyable. Most manufacturers offer five nicotine levels, but Vapor4Life offers seven. You can choose between no nicotine, 4mg, 8mg, 11mg, 18mg, 24mg and a truly massive 36mg. This is great for heavy smokers and those looking to reduce their intake of nicotine gradually. Vapor4Life is a truly outstanding choice if you’re a particularly heavy smoker. Vapour production falls a bit short of expectations. It’s more noticeable with the automatics, but that’s why we’ve always preferred manual batteries. Hopefully they will be working on this in the future, but the vapour is truly what e-cig enjoyment is all about and of course larger batteries always perform better. These batteries do seem to last long and that’s good news. A full charge is more than enough for a day’s worth of use, and the voltage is sustained for quite a while. You will notice the dip in vapour production when the batteries start to wear down. Charging time is around 2 hours for a full charge. Shipping is fast and reliable. The customer service is responsive. Overall these are a bit pricey, for the vapour production, but they have many loyal users, so they are worth giving a try. The warranty lasts for 90 days. There’s also a 30 day money back guarantee in case you aren’t happy. If you would like to submit your own vote for Vapor4Life – please feel free!